North Yorkshire Police has urged motorists to slow down on the county’s roads after revealing it has caught drivers doing more than 80mph in residential areas. The figures, broken down by district, show the highest speed recorded in any 30mph zone in the region during the last 18-months was in Harrogate, where a driver was clocked at 82mph. Another driver was caught doing 74mph on a 30mph road near a primary school in Kettlewell – while another was recorded doing 103mph in a 40mph zone near Selby. All of the the incidents were recorded by the force’s mobile safety cameras. North Yorkshire Police has revealed the information as part of its year-round campaign to make the county’s roads safer. Called ‘If you saw what I saw…’, the campaign uses the first-hand experiences of police officers who attend fatal crashes, to urge motorists to drive more carefully. 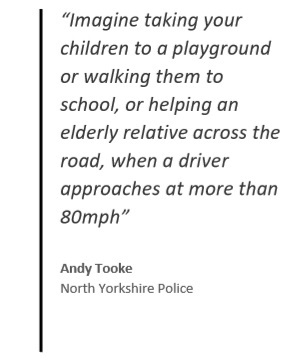 Andy Tooke, criminal justice operations manager for North Yorkshire Police, said: “People sometimes question why we use mobile safety cameras to enforce speed limits. “Imagine taking your children to a playground or walking them to school, or helping an elderly relative across the road, when a driver approaches at more than 80mph. 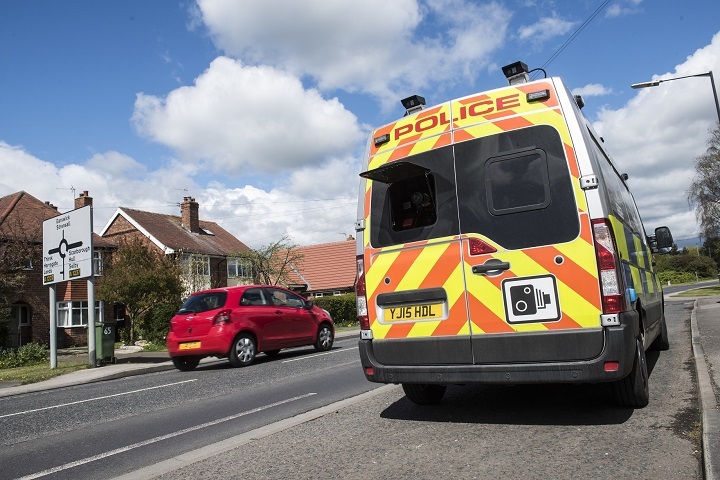 North Yorkshire Police has moved to reassure residents that 30mph areas are frequently visited by safety camera teams, and that many villages and suburbs are among the force’s priority enforcement sites. Mr Tooke added: “It’d be great if we didn’t need to use mobile safety cameras to enforce speeding. But unfortunately some people don’t consider the consequences of their actions. “By revealing some of the speeds we’ve recorded recently, we hope drivers will think about why speed limits exist and why it’s not ok to break them. On the other hand Dave, consider the millions and millions of drivers and riders (including you and me) who have passed speed cameras – fixed and mobile – without incident and it puts it into perspective. Perhaps investigate why that may be. No they are not theoretical Hugh, please read on below the 9 examples under “Direct influence of speed cameras on collisions”. This includes a couple of examples. They’re theoretical negative side effects Dave, limited only by the imagination of the writer and “may” happen not “will” happen nor “have happened”. Whatever, they pale into insignificance when compared to the negative side effects of speeding which are real, not imagined. The quote from the article “If you saw what I saw…” is a sobering reminder. The net effect (inc positive and negative) could be quantified by running scientific trials. Happy to acknowledge that I may be right, without scientific trials Dave – but do please elaborate on the ‘negative side effects’ that prosecutions might bring and how you’d quantify that for the evidence-led approach you seek. Read your own 1st comment, Hugh. Do the “80 past children” get prosecuted? It might be a benefit to road safety if they were but it would still require that this was greater than any negative side effects. Look, if you are right, then scientific trials will prove you right. If you are wrong then we will gain new insights to road safety which will allow us to start really saving lives. We need to stop talking about an evidence-led approach, and actually implement an evidence-led approach. I know the answer will be ‘no’ but I suppose I have to ask.. Dave – As you’re so keen on evidence from others – where’s your ‘evidence’ for “But the vast majority of those penalized will be those who would not have crashed (ie the safe and considerate drivers)” Are you including those mentioned in the article e.g. doing 74mph in a 30, 103mph in 40 etc. in your ‘safe and considerate drivers’ or would you, just this once, acknowledge that in these cases, the cameras did their job and undoubtedly have made the roads safer for a while (it’s okay we won’t tell anybody). Speed cameras only take a picture and that may not be sufficient to successfully prosecute the reckless (ie if they are criminals or in a stolen car etc). Therefore the cameras may provide little benefit. But the vast majority of those penalized will be those who would not have crashed (ie the safe and considerate drivers). So maybe that’s one reason why mobile speed cameras are increasing fatal and serious collisions? If they modify the behavior of those drivers who would not have crashed, their crash rate can only go up. We need to prove what effect speed cameras have, just as we would demand of all other safety products. Just run the trials, it’s not difficult! Dave Finney – I suspect that a randomised study of sending a statistically significant number of vehicles at 80mph past school children would be seen as unethical. More seriously do you really believe that roads with vehicles travelling at high speeds are conducive to encouraging active travel quiet apart from any actual collisions. Sorry, but this king of behaviour isn’t minor road traffic law infractions? These are wanton acts of criminality! This type of disregard for the safety of others, should be classed in the same way a person wilfully & recklessly discharging a firearm in public place. If they hold a license a custodial sentence. If unlicensed a longer custodial sentence. There is no protection or justification under the law to excuse these morons. Isn’t the ‘scandal’ that we have some drivers in our midst who think it’s okay to do the speeds quoted and we’re not getting them of the roads quick enough nor for long enough? Why is it then that the most accurate evidence available finds that fatal and serious collisions increase at those locations where mobile speed cameras operate? And why also, if drivers are exceeding 80mph past school children, do the vast majority of fatal and serious collisions (>92%) occur when drivers are not speeding? Remember that the authorities are selling a safety product to British citizens. Not only have the authorities failed to provide the appropriate evidence that their product does indeed improve safety, but they refuse to run the tests that would provide that proof. British citizens have a right to demand competency and honesty, and they are not getting even that from the authorities. This needs to change. Let’s run the scientific trials, find the truth, and end this scandal. West Yorkshire Police have been doing an intervention called Operation Hawmill since its inception in 2016 when the Police in the Calderdale area have been highly visible and pro active in reporting offenders for speeding, use of mobile phones , no insurance or just behaving badly and anti socially. Its been responsible for a 30% drop in collision figures every year since then. The same thing has been happening in the Bradford area with Operation Steerside. Both these Operations have been deemed to be incredibly effective and act as a warning to those that would flout the law and in particular those that put other lives at risk, that they will be caught and put before the Courts. Well Done North Yorkshire and West Yorkshire police. Lets have more of it. I’d like to be reassured that all the offenders were substantially penalised – the link to the site only refers to one, who only received a 6 month ban and had to pay some money. Any reason why these people should ever be allowed back on the roads at all?